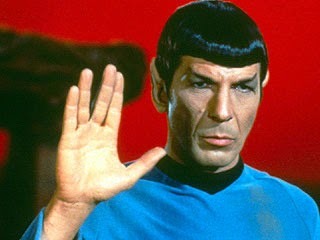 Do you remember that old TV show “In Search of…”hosted by Leonard Nimoy? It wasn’t quite as cool as Star Trek, but Nimoy did explore some crazy stuff including Big Foot. The Sasquatch is a mythical creature and up here in the Pacific NW there are a lot of people that claim to have seen him, uh her, or whatever… Just like Big Foot, we grow grapes up here in Washington State that are rarely seen. We see plenty of Bordeaux and Rhone varieties growing in Washington. We also have more than our fair share of white wine grapes from Burgundy and Germany. But, what about Spain, Italy, South America and Southern France? My mission on day two of Taste Washington was to seek out wine grapes from these countries and regions. Come explore the outer reaches with me as I go in search of… unusual grapes. Carmenere is a grape from France, originally grown in the Bordeaux region. Today, you are more likely to find Carmenere growing in Chile rather than France. This wine grape also has fans in Washington State. The most unusual wine I found at Taste Washington this year haled from Bartholomew Winery. Bart Fawbush at has always made unique blends featuring unusual varietals. For 2013 he has outdone himself with a rose’ of Carmenere You would never recognize this rose’ as being made from Carmenere in a blind tasting. Bart pressed this whole cluster with extremely minimal skin contact. His goal was to avoid the overly herbal and spicy character that you would typically associate with Carmenere. Success! This rose’ is extremely light in color, it takes on an almost tangerine hue. It shows notes of dried straw and herbal dusty strawberries with a hint of melon all riding on a bountiful streak of acidity. Not too far away, I came across another Carmenere. This one was being served up by Beresan. I was drawn to this Carmenere for two reasons. First, the profile was showing notes of dried dark cherries along with dry cedar and white pepper giving way to a herbal cracked pepper finish. Second, Beresan’s Marketing Director, Dominique Calle, recommended an inspired pairing of their Carmenere with white cheddar Pirate’s Booty. Moving on, I made my way toward a grape the French still grow, although it is rarely bottled on its own. Mourvèdre is most commonly used as a blending grape with Grenache and Syrah in the South of France. You do find single variety Mourvèdre from Bandol, which is about as rare as single variety bottlings of this dark, robust grape in Washington. Only two wineries were pouring a Mourvèdre this year. Eleven Winery, named for the smallest cog on the rear of a 10 speed bicycle, was one of those wineries. Eleven’s owner/winemaker, Matt Albee, is making some nice wines and he says that Mourvèdre is his favorite grape. 2010 is the second vintage of Matt’s Mourvèdre which features grapes sourced from the Sugar Loaf Vineyard. The wine shows great dark and meaty character with dark currants and earthy smokiness that is followed by a finish of dry cedar and white pepper spices. Winding my way in search of more unusual varieties I started searching for wines made from Italian grapes. Sangiovese is prevalent enough these days that it clocks in at number 20 on the list of wine grapes grown in Washington. Making the US Census report means you are no longer eligible for the “unusual” label and the In Search Of… directors have banned you from their programming. Instead, I found two excellent Italian alternatives: a Barbera and a Nebbiolo. Cavu Cellars brought their Barbera to Taste Washington this year. The grapes are sourced from the Alder Ridge vineyard in the Horse Heaven Hills AVA. 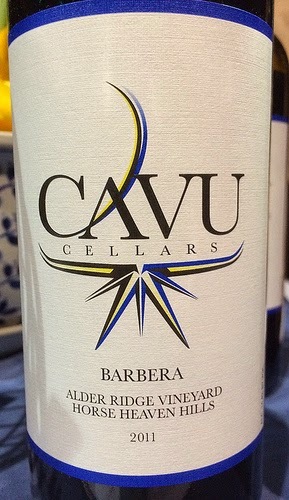 The Cavu Cellars 2011 Barbera is smooth and dark featuring cherries and some notes of dried mint. The finish is dry with a nice touch of tannin inspired spices. This wine would definitely pair well with your favorite Italian dish. Cavu also had a secret pour behind the table. The rose’ of Barbera came straight from the tank and was showing herbal notes of huckleberry and light touches of melon backed up by a beautiful streak of acidity. Moving on to a grape heavily featured in the Piedmont region I discovered an awesome Nebbiolo being poured by Lou Facelli of Facelli Winery. Lou said he was going for a Barolo style with his first Nebbiolo. I would say he hit the mark with this 2008 Nebbiolo that was just recently released. It shows excellent character of dried cherries, raspberry, olives and mineral earthiness finishing off with layers of tart menthol spices. Finally, I ventured into Spain with Victor Palencia’s Albarino made with grapes sourced from the Ancient Lakes AVA. Albarino is most commonly found in the Northwest of Spain in the Rias Baxias region. This white wine grape is known for its minerality and acidity, two characteristics that are abundantly evident in the grapes grown in Ancient Lakes. Victor’s Albarino is dry and crisp with notes of light green apples, mineral laced honey dew melon and some herbal characteristics followed by white flowers and a zingy acidic finish. While each of these grape varieties is well known in other parts of the world, when in Washington you need to go “In Search of…” to find many of these wines. Once you find these unusual wines there is no guarantee that the wine will be a good representation of the grape. 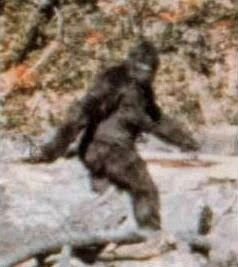 Similar to a Sasquatch sighting: you never know if it is true or a just hoax. The sightings I made a Taste Washington are all legit. I believe that I found winemakers that are holding true to the character of each of these grapes. If you are feeling adventurous, I would recommend going “In Search of…” each one of these wines. You're looking for unusual? Try any of the Puget Sound AVA wines like Lopez Island wineries Madeliene Angevine, Vashon's Chassales, Bainbridge's Mueller Thurgau, Perennial Vintners Magelica, Whidbey's Siegerrebe... These wines are "fascinating"!